A Shih Tzu puppy topknot might be just the answer to all that facial hair obstructing the view of those beautiful Tzu eyes. Even if you can’t decide whether to have your puppy grow out his hair to floor length or clip into a puppy do, a small puppy topknot will help keep stray hairs out of his face and keep him looking neat and clean. 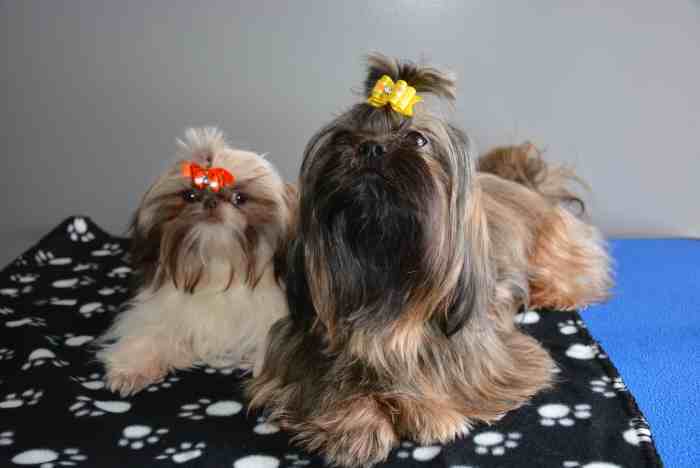 Many people will choose to keep their Shih Tzu in a shorter cut and still maintain a small topknot. If you are considering showing, you will need to grow out the coat so don’t go near the face with a pair of scissors!! We will assume that you have been working with your puppy and training him to enjoy the grooming experience. It’s very hard to put a topknot in properly if your little one is fidgeting everywhere. If you don’t think you can put a pony tail on a moving object, stop and work on some grooming training first. This will be a tiny topknot because the puppy just doesn’t have enough hair yet. Hair bands come in a variety of sizes, but the smallest sizes are the one best used for puppies. The bands that work the best without splitting or tearing hairs are the orthopedic bands used in Dentist's Offices for braces. These bands also come in different strengths from light to heavy. You can also purchase them in colors or natural. A $6.00 bag of 100 bands will last you more than three months if you use one per day. The lightest bands break easily and the heaviest are hard to work with so I usually opt for something between the two extremes for older puppies and the lighter bands for young puppies. Start by dividing or parting the hair just above the top back of the nose. 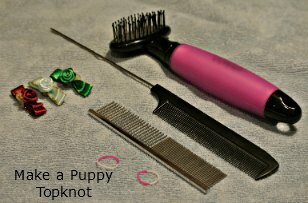 A rat-tail comb works well but you can also use a fine toothed comb if you’re afraid the puppy might move. You can also do this with your fingers. Make the part just between the eyes. Next gather up the hair in a V shape above the nose between the eyes. The wider part of the V is closest to the nose. Place a tiny elastic band. If you prefer not to order the bands above from Amazon, you can also purchase them from a beauty store. Comb the whiskers down and away from the eyes. To train them to lie properly, a dab of Petroleum Jelly can be placed on them. A soft puppy brush can be used to help train these hairs to lay flatter on the face. For a more professional look, try a product or two that Show Dog People Use. This Product helps keep top knots in place and prevents flyaway and stray hairs. It is also good to control static elasticity. Since it has a pleasant odor, it may be preferable to petroleum jelly. 5. If desired, add a small bow to finish it off. I have found that puppy bows do not stay in well so you may want to wait a month or so before purchasing cute bows. As the hair grows, you will be able to take in more hair to make larger topknots. To do this, make a longer part at the top back of his nose and again, gather the hair into an inverted V shape. Once the puppy has reached maturing, the part for his top knot will be made from the other edges of each eye.